Preheat the grill. Put the dandelion leaves into a large bowl, cover with cold water, add the salt, and leave to soak for 30 minutes. This will reduce the bitter taste and release dirt and any bugs. Rinse thoroughly and put to one side. Also rinse the little gem leaves and the watercress, and set those aside, too. Grill the bacon under a high heat until crisp, tear into large pieces and place on kitchen paper to drain. Lower the eggs into a small pan of simmering water and cook for 7 minutes until softly boiled. Drain, cool under running cold water and peel off the shell while still warm. Cut each egg in half. Whisk together all the ingredients for the dressing. 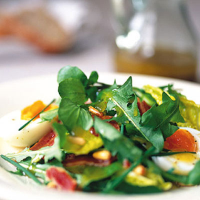 Combine the greens, eggs and bacon in a large salad bowl and drizzle over the dressing. Sprinkle over the chives and pine nuts and serve with some crusty bread.